You're probably aware that I wrote my own Twitter client application, called Halfwit. It has served me well and is still my favourite client to this day. However, Halfwit is not without its problems. It relies on TweetSharp, which in turn relies on Hammock, and neither of those two projects are actively maintained anymore. In recent versions of Halfwit I've had the occasional crash or failed assertion, which is annoying at the best of times and super annoying if it happens in your own application because of code you don't own. You can check out the code over on the project page. I'll reproduce the readme in its current form here, to give you an idea of how you can use Budgie in your own applications. I mean to keep Budgie alive as a project, so if you want to make suggestions or contribute code via a pull request, feel free. As with all my projects, Budgie is released under the Microsoft Public License. And yes, Budgie is on NuGet (currently in prerelease form). 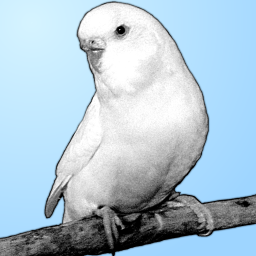 Budgie is a very simple library to access Twitter via its HTTP API. All methods in the class library are asynchronous, returning Task<T>, so you can await them if you're using C# 5. Budgie is a .NET 4 Client Profile library for now. // "searcher" is a Task<ITwitterResponse<IEnumerable<TwitterStatus>>>! Phew! Thank goodness for "var"! That's it! You now have a Console app that searches Twitter for the word "budgie" and displays the results. // Step 1 - acquire a "request token" from Twitter. if (requestToken == null) return; // something went wrong. // Step 2 - open a browser so the user can sign into Twitter and obtain a PIN. // Step 3 - ask the user for the PIN and pass it back to Twitter for an "access token". You'll want to save the Token and Secret properties of accessToken away for next time you run your program so you don't have to ask for a PIN each time. // You can optionally ask Twitter for your user details, if you didn't save them. // Get a task which is downloading the home timeline. // Block and wait for it to finish (or await it in C# 5). // check if the search succeeded and display the tweets. That'll get a maximum of 50 tweets, and only those tweets that have been posted after the tweet with that Id. // Just for kicks, let's wait for both of those to finish in one line. Be aware that Twitter aggressively limits calls to its "lookup users" method (independently of normal rate limits), so you won't want to call it often. // do stuff with the tweet you just posted. // do stuff with the reply you just posted. // do stuff with the retweet you just posted.